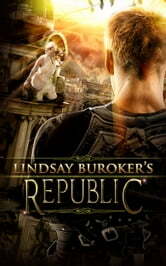 Republic takes place a few months after the events of Forged in Blood I & II. I love this series!!! It keep getting better with every book . it will keep you turning the pages until the end. Than you can't wait for the next book to come out so that you can read on in the story. Its such a good series that you can't help reading it over again . I wish that the series would not end. I don't feel ready to let the characters go. While extrapolating on several concerns which the Emperor's Edge left unresolved, this book also provides an excellent storyline that keeps you guessing right until the end. I throughly enjoyed this book, and lost precious beauty sleep in my endeavor to avoid the inevitable withdrawal symptoms that come with putting it aside. A word to the wise, this is not a standalone book, but a part of an intricate and thrilling series. You'll be glad you have. I loved this whole series, I'm sorry it had to come to an end!! I look foward to reading more from lindsay and about these characters! !